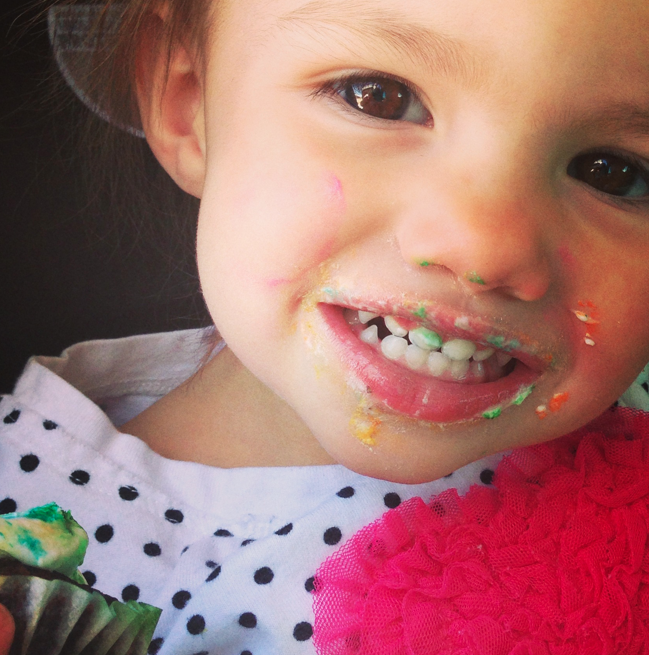 This is my lil' precious "cupcake" Ellie, with her sister's birthday cupcake all over her face. Our babies are such blessings and precious treasures just waiting for us to fill them up with love and confidence, and they are just waiting for us to teach them. *Even when they do something wrong, it's a chance for us to teach them. I see so many parents when I'm out at a store, and the way they treat and talk to their kids is just awful. They are either talking to a toddler like they are an adult, talking to them in such a harsh and awful way, or they are being awful examples. My heart broke as I was in Michael's Craft store one day and a little girl tried to reach for something on a shelf, and a bunch of things fell off the shelf, instead of her mom saying, "oh honey, are you ok? Let's pick all these up and next time ask for mama to help you"...the mom began screaming and cussing at the little girl and calling her names. My heart was so broken for that little girl in that moment, I went over to help pick up some things, to smile at the little girl, and tell both her and her mom: "it's ok, we all have accidents like this sometimes" and gave that little girl a big smile. I just looked at the mom and said, "part of being a mom is just helping our kids when they have little accidents, huh?" and I smiled, hoping to reach some loving part of that moms heart and remind her that being a mom is about guiding and teaching, not screaming and anger. I saw a young dad, grab away his daughter's little drinking cup and say: "MINE! That's MINE!" And although he may think he's having fun joking around, he doesn't realize, he just taught his daughter that, that's what you do, you take something away from someone and say mine, and then you don't give it back! *The worst part was- when he gave it back to the daughter, she did just like her dad and said, "Mine", then he got upset that she wouldn't share it with him. He just taught her the wrong thing to do, confused her, and then got mad, that she did, what he taught her to do! NEVER PLAY THE "MINE GAME", always teach how nice it is to share, and how letting someone else play with a toy, will make them happy, and that should make us happy! #2. "WHY DID YOU DO THAT?!?" OR "WHAT WERE YOU THINKING?!?" "why did you hit your sister?" "why did you spill milk all over the floor?" "well, the reason I hit my sister was because she made me angry, and I had a moment where I was unable to my control anger, and I saw no other solution but to hit her". "Yes, I spilled the milk because I was trying to be independent and wanted to get the cereal by myself, but I then realized I am not the best at walking with a bowl of cereal, so then it spilled"
*You are never going to get the answer you want to hear, especially from toddler, well even from a teenager, really. *And you are beginning the process for them to learn to make up an excuse. And most likely begin to blame someone or something else, instead of feeling like they can always honestly tell you what happened. And always make sure you stay calm, calm parents keep love in the lessons of life and and a lesson that really matters to the heart, is one that is taught in love, not in screaming and yelling. *Find out if anyone is hurt- a sibling that may have gotten pinched or punched, you never know! 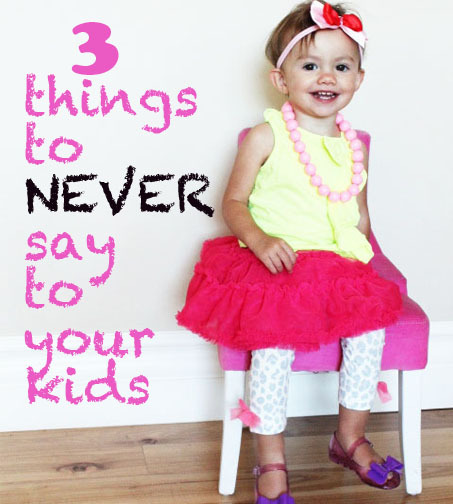 *If there is a mess, calmly say: "ok, let's clean this up first, then we can talk about what happened"
After they see that you didn't freak out over the mess or accident, their little hearts will feel it's ok, as long as you stay in a loving and calm manner, to talk to you about what happened. *Angry parent who is mad, is a very hard person to want to open up to about the truth, for fear of even more anger. The most important thing in parenting and in life: is to show love and love others. Even in teaching your kids what's right and wrong. If it's done from a loving heart, you will produce loving kids, that treat you an others kindly. Shut up is a rude and disrespectful reply. We were never allowed to say shut-up growing up, and my parents never said it to us kids. If someone is speaking to you or being loud, there are other ways to deal with that and ask people to be quiet. And when I 've seen a mom say this to her little toddler in a shopping cart, it just made me sad, that a mom would say that to her child. If your toddler, who will have a hard time being quiet- it's like asking a baby to stop crying and be quiet, is being loud, just practice whispering and saying "let's be quiet right now, then later we can play and be loud, or sing songs and talk and talk, but right now let's be quiet and whisper"...and demonstrate by whispering or being quiet too. 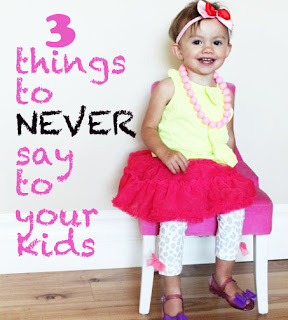 Now I have a much larger list of things I hear parents say that just break my heart...if you like this post let me know and I'll do another one on the rest...ha ha ha This is not a post on how to discipline your kids, just things I don't think parents should say to their children. Love always needs to be the strongest emotion your kids feel from you! Don't feel bad if your kids don't obey you all the time, think about how God feels about all of us! It's Party Time for Someone! How We Roll On the Weekend...Trophy Time! Emergency Rooms, Toys R Us, and Groceries oh my! Do you love the sour and the dapper?